As far as presidential inaugurations go, this year's is expected to be warmer and wetter than average. The inauguration has been held on January 20 since 1933, when the 20th amendment shortened the lame duck period. Since that time, the typical weather for a presidential inauguration is a partly cloudy day with temperatures in the mid-to-upper 30’s. This Friday, swearing in ceremonies are expected to take place with temperatures in the 40's and rain on the way. It hasn't rained at a presidential inauguration since President George W. Bush's first inauguration. Other inaugurations have been plagued with worse weather than some light rain, including winter storms that nearly shut down the city (JFK) and freezing cold temperatures that moved ceremonies inside and canceled the parade (Reagan's second inauguration). 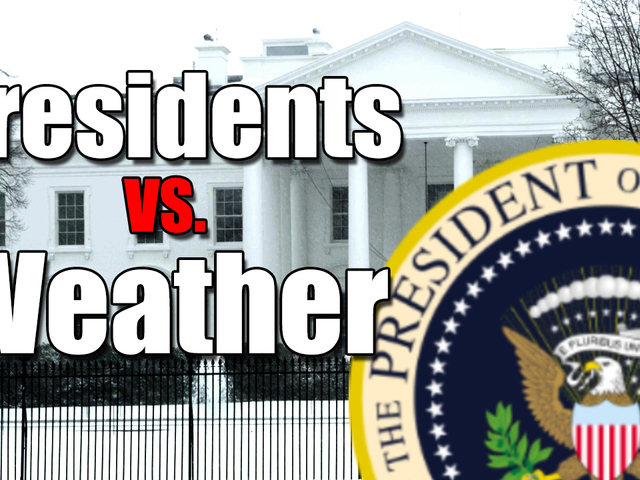 Watch the video above for more instances of our presidents going head-to-head Mother Nature.